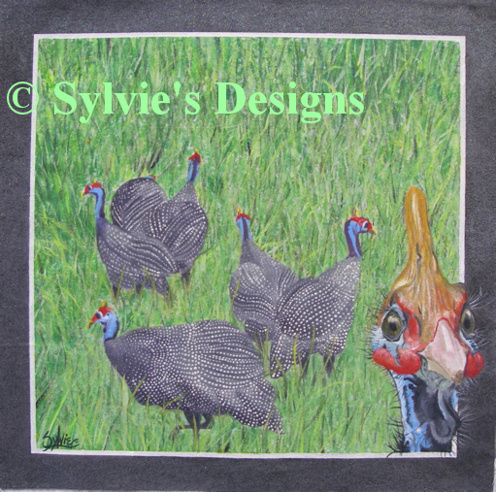 I know that most people have seen a Guinea Fowl in pictures, but many haven't actually seen one in the flesh. If they happen to become road kill it's more likely that your car will be the one that dies not the bird. It can do great damage to a vehicle. So if you see one, don't try and run it over, you'll regret it. This video shows the sounds that the male Guinea Fowl make... They don't make this noise all the time :-) They do sleep sometimes .. lol.... They love to eat ticks, so farmers love to have them on their farms :-) They'll wake you up early in the morning. 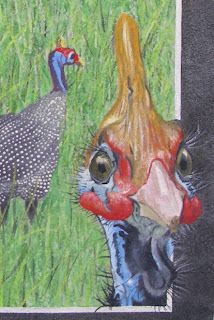 Anyway the reason I'm writing this is because A little while ago I was asked if I would paint a picture with Guinea Fowl and eventually this past week I got down to it.